You know those wrought iron gates and fences we’ve seen in the movies? Well, if you go looking for them today, you’ll find that, unless you happen upon a very old, well-kept building, you probably won’t find real iron fencing systems and gates. That’s probably why when we see wrought iron fencing in a film, it’s either from another century, or it’s used in a scene with a creaking gate and eerily dilapidated house. Nowadays, iron fences simply aren’t used, and most of the time, when you see a fence that looks like it’s made of iron, it’s probably steel or aluminum instead. Iron is very rarely used by commercial fencing contractors, as we’ve developed alternatives that mirror the look of iron but are several times more durable and weather-resistant. 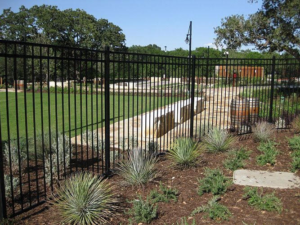 With galvanized steel ornamental fencing, you’ll be able to create the aesthetic look of an iron fence without having to worry about rusting and corrosion, an inevitable outcome for a real iron fence.